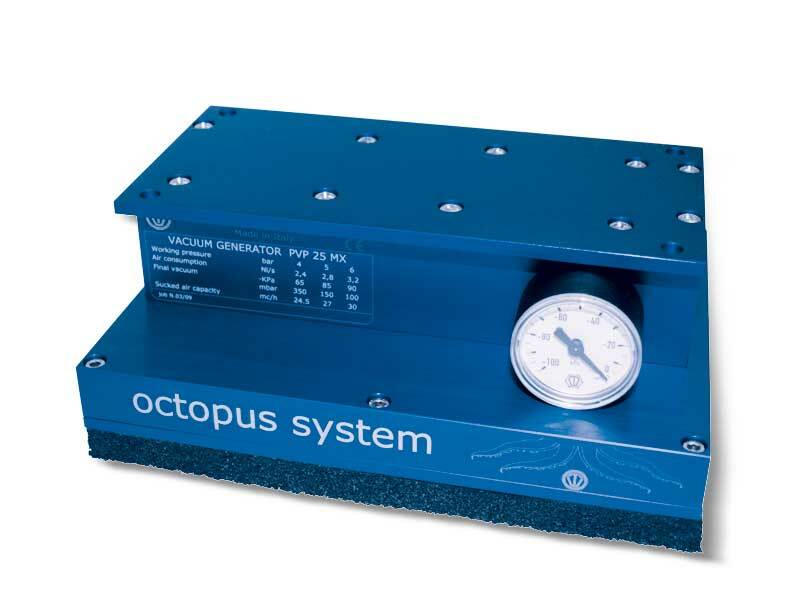 The OCTOPUS systems described in the following pages are equipped, as a standard, with suction plates PX. Should you want to replace these plates with others with different features you will have to modify the identification codes as described in this page. - A compressed air-fed vacuum generator as shown in the picture and in the drawing, that has to be ordered separately, since it is not included in the code. 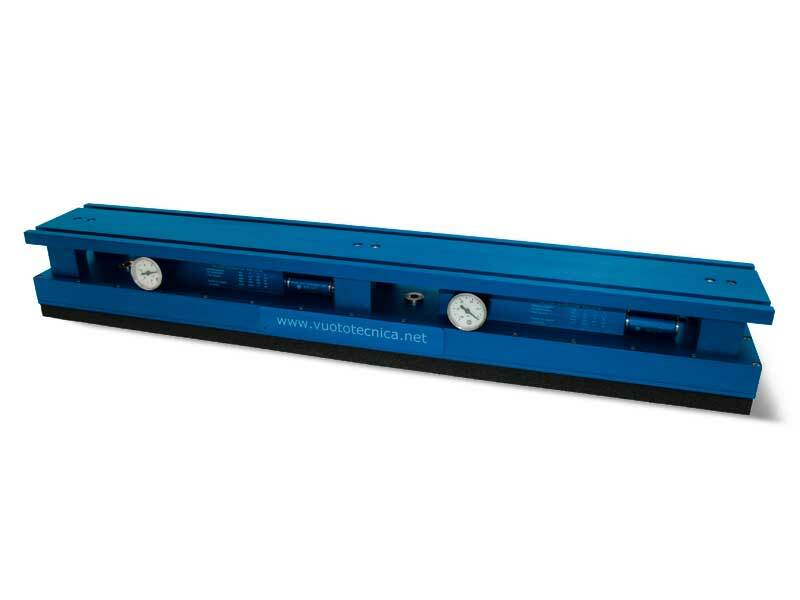 - An anodised aluminium box, open on one side, with a built-in micro-fine very easy to inspect. On the outside of the box there are one or more connections for the possible installation of control devices or solenoid valves for a prompt restoration of the atmospheric pressure on its inside. - A suction plate sealing the box also made with anodised aluminium and coated with a special perforated foam rubber. This suction plate perfectly adapts itself to any surface, either smooth, rough or uneven. With the same system, for instance, it is possible to grip and handle cardboard boxes and the wooden pallet that supports it. 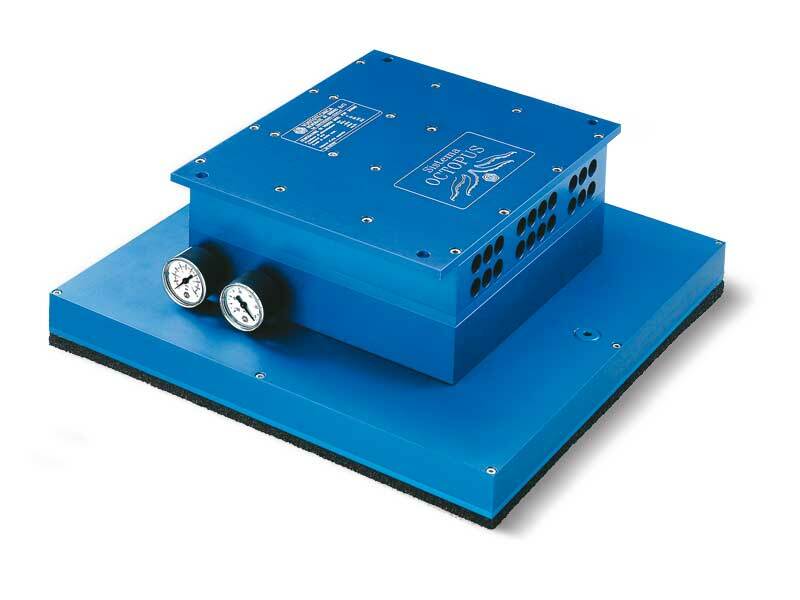 These OCTOPUS systems can be supplied, upon request, with other dimensions, suction plates and vacuum generators than those indicated in the tables. The OCTOPUS system is our answer to the ever increasing requirements of operational flexibility for palletising robots and vacuum gripping systems in general. 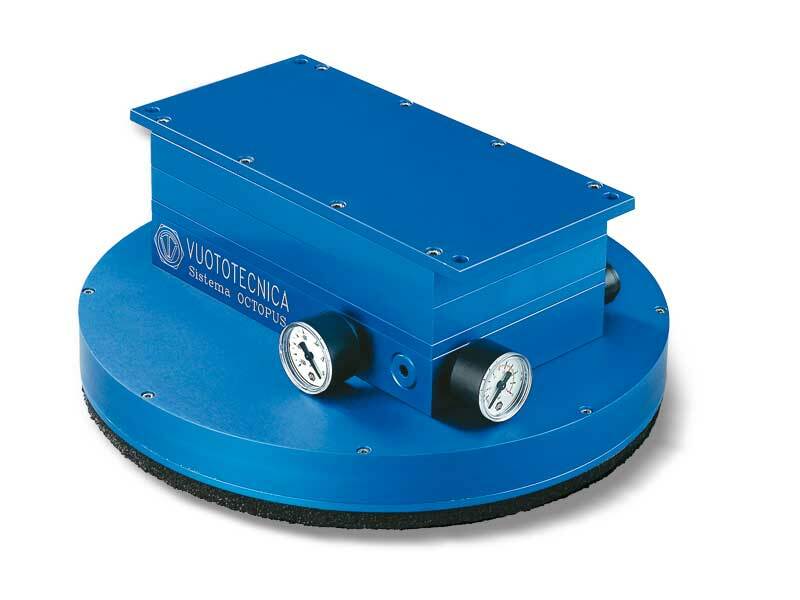 This system, in fact, it allows gripping objects of any shape and feature, provided that they do not have an excessive transpiration, without having to change or place vacuum cups, and even when their surface occupies only 5% of the whole suction plate. The maximum weight of the load to be lifted will obviously be proportional to the gripping system. 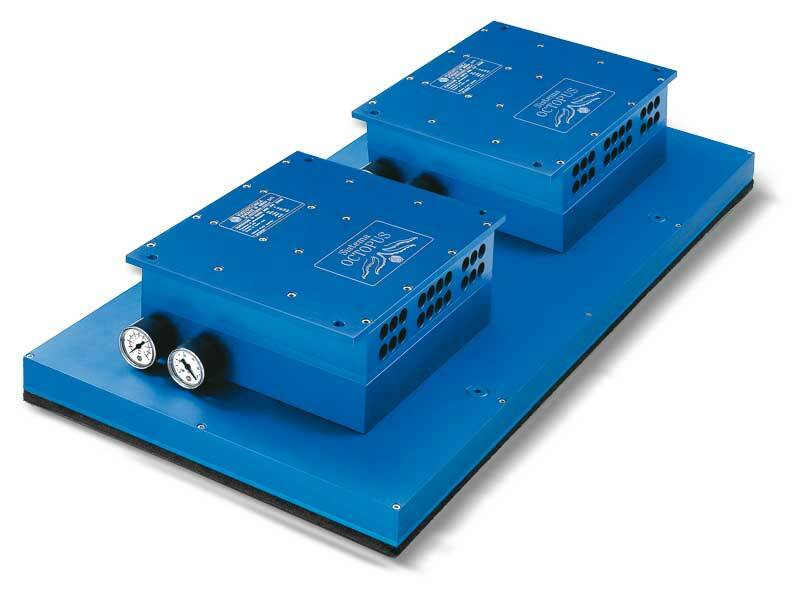 - Two compressed air-fed vacuum generators, as shown in the picture and in the drawing, that has to be ordered separately, since they are not included in the code. - An anodised aluminium box, open on one side, with two built-in micro-fine stainless steel mesh filtres on the suction inlet to protect the vacuum generator, very easy to inspect. On the outside of the box there are one or more connections for the possible installation of control devices o solenoid valves for a prompt restoration of the atmospheric pressure on its inside. 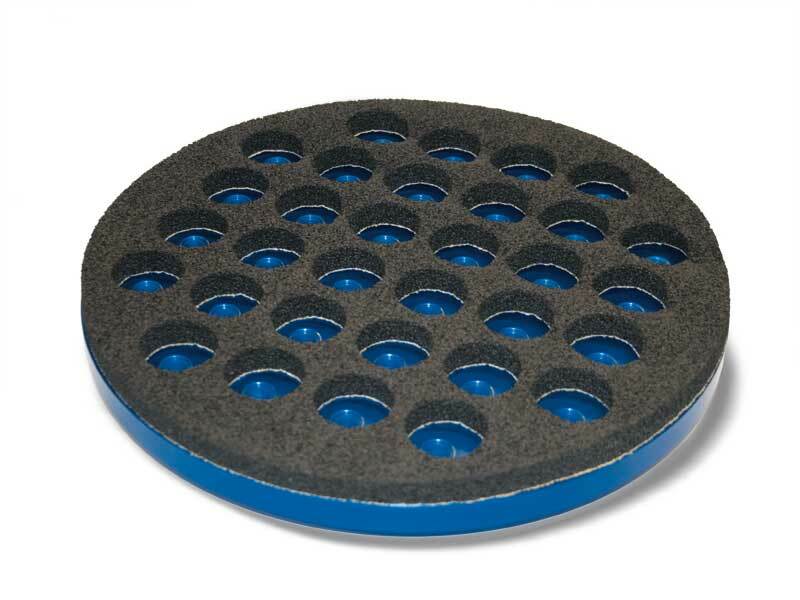 - Un suction plate sealing the box, also made with anodised aluminium and coated with a special perforated foam rubber. The suction plate perfectly adapts itself to any surface, either smooth, rough or uneven. With the same system, for instance, it is possible to grip and handle cardboard boxes and the wooden pallet that supports it. The suction plates PX described in this page are installed, as a standard, on all OCTOPUS systems and, therefore, can be supplied as a spare part. They are made with anodised aluminium and coated with special perforated foam rubber with two types of thickness: 15 mm, for suction plates of the PX range; 30 mm, for special suction plates of the P2X range. 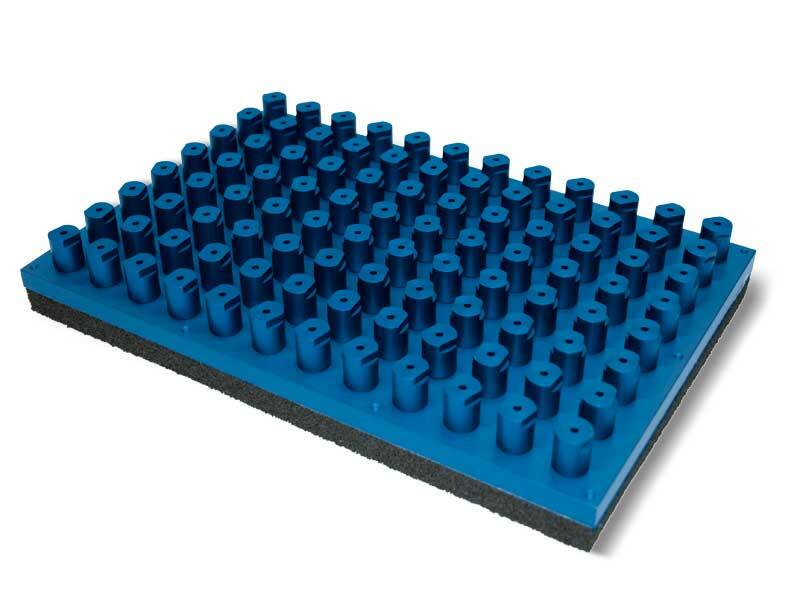 Their lifting force has been calculated considering a minimum vacuum level of -75 Kpa, the overall perforated surface on the foam rubber and a safety factor 3. The suction plates described in this page are the same as the previously described ones. Their distinctive features are the shut-off valves inserted in each hole. In absence of an object to grip or in case of a defective grip of the foam rubber, the shut-off valves automatically close the suction inlet, thus preventing the vacuum level from decreasing on the other gripping holes. This feature allows reducing the vacuum generator capacity compared to the standard OCTOPUS systems, all to the benefit of energy saving. Compared to the standard ones, these suction plates, given the same gripping surface, develop a greater force (art. PY) and can grip even very rough and uneven surfaces (art. P2Y). They are made with anodised aluminium and coated with special perforated foam rubber, with two types of thickness, upon request. They are perfectly interchangeable with the standard suction plates. 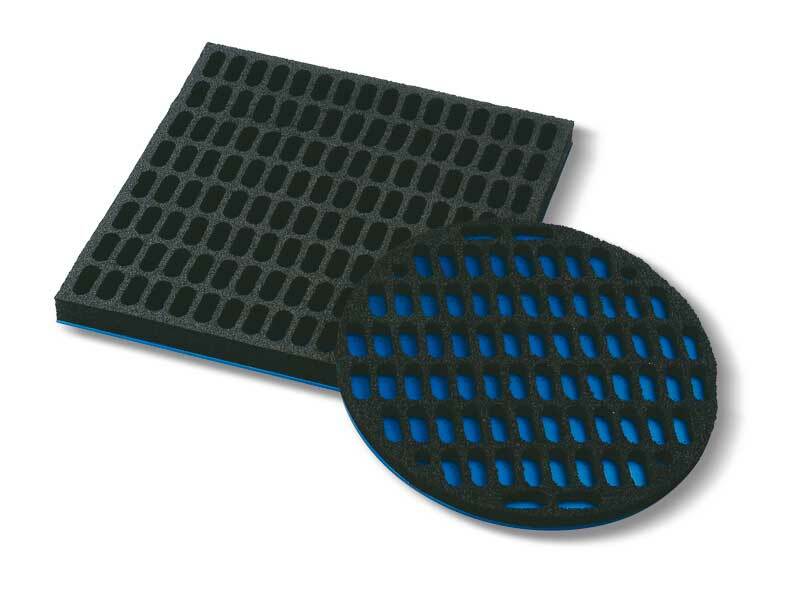 Their lifting force has been calculated considering a minimum vacuum level of -75 Kpa, the overall perforated surface on the foam rubber and a safety factor 3. Among all the suction plates described up to now, these are the ones which develop the greatest lifting force given the same gripping surface and vacuum level. 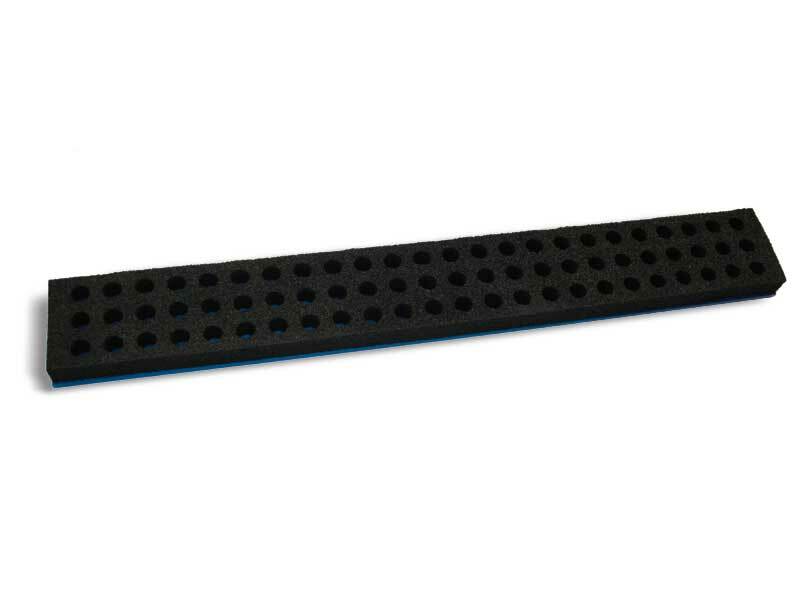 Moreover, the P2Z version is also able to grip very rough and uneven surfaces. They are made with light alloys and coated with special foam rubber with slot holes, with two types of thickness. They are perfectly interchangeable with the standard suction plates. 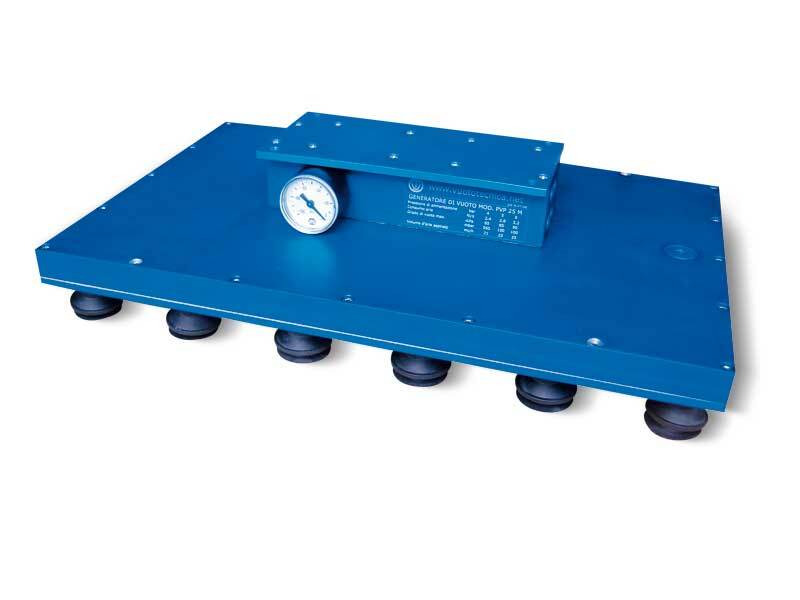 Their lifting force has been calculated considering a minimum vacuum level of -75 Kpa, The overall surface of the slot holes on the foam rubber and a safety factor 3. These suction plates provided with vacuum cups have been designed to ensure a better grip on uneven and very flexible surfaces (pasta or candy bags, blister or skin-film packs, thin cardboard boxes, etc. 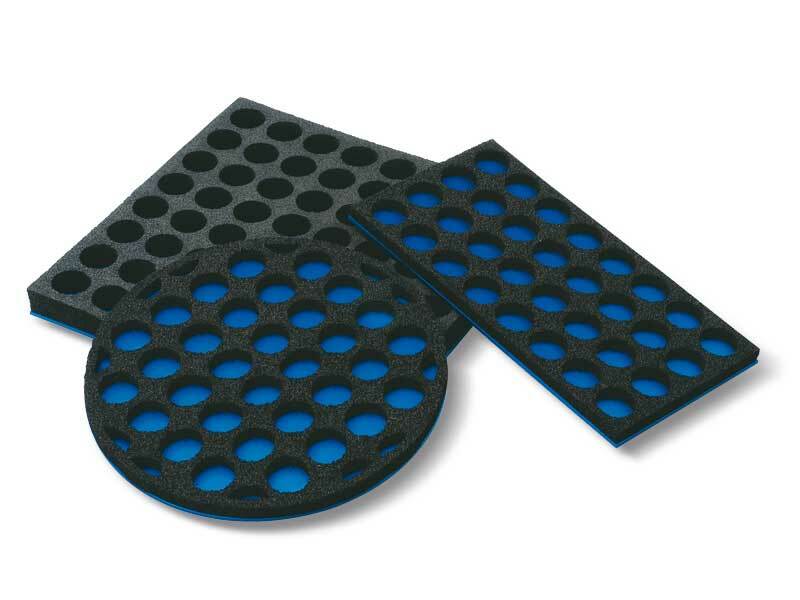 ), which are difficult to grip with suction plates coated with foam rubber. We recommend using bellow cups. Thanks to their great flexibility, they adapt themselves to any gripping surface, following its profiles and movements during the lifting phase, guaranteeing a firm and safe grip. They are made with anodised aluminium, as are the vacuum cup supports screwed onto them, which are 1/8” gas supports for the PV version and 1/4”gas for the P2V version. 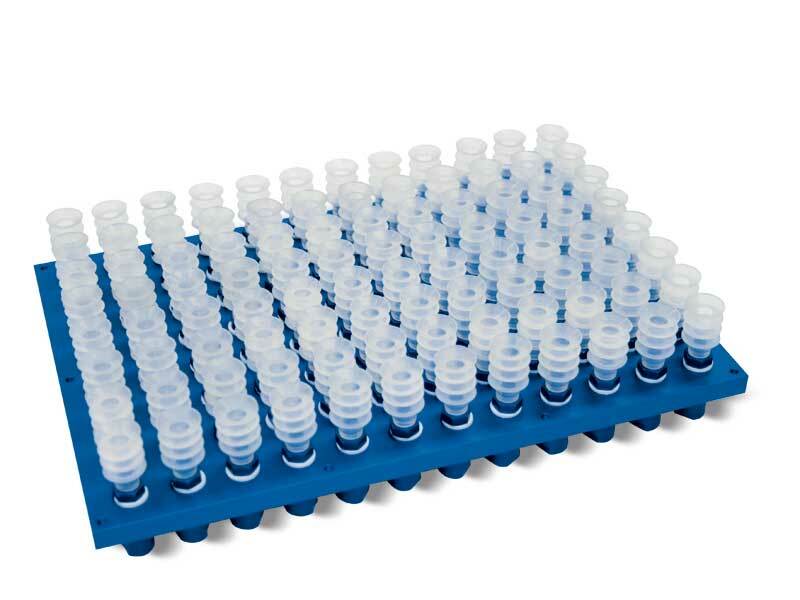 The cups are cold assembled onto the supports with no adhesives and can be provided in other compounds. Also these suction plates are perfectly interchangeable with the standard ones. Their lifting force has been calculated considering a minimum vacuum level of -75 Kpa, the overall vacuum cup surface and a safety factor 3. Upon request, they can be provided with different cups, as long as the diameter does not exceed 22 mm for the PV suction plates and 45 mm for the P2V ones. The suction plates described in this page are the same as the previous ones. Their distinctive features are the shut-off valves inserted in each cup support connection. In absence of an object to grip or in case of a defective grip of the foam rubber, the shut-off valves automatically close the suction inlet, thus preventing the vacuum level from decreasing on the other gripping holes. 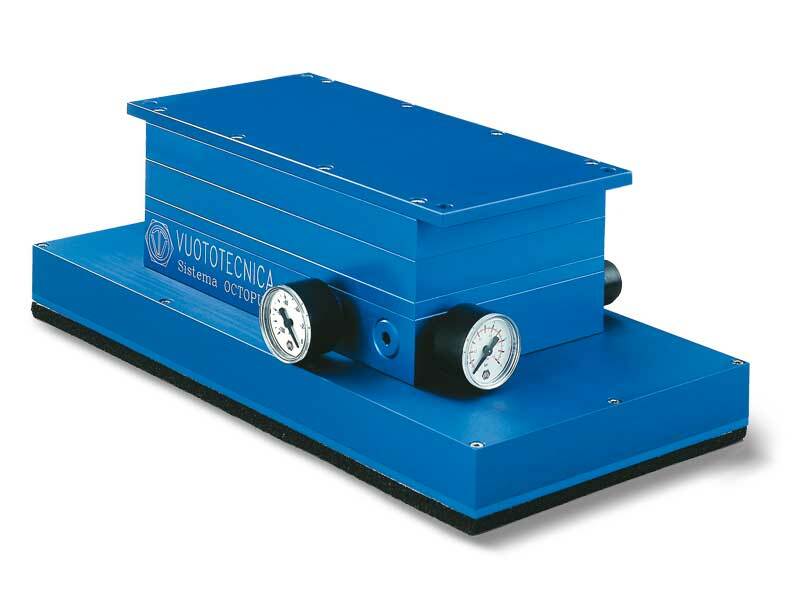 This feature allows reducing the vacuum generator capacity compared to the OCTOPUS systems without valves, all to the benefit of energy saving. 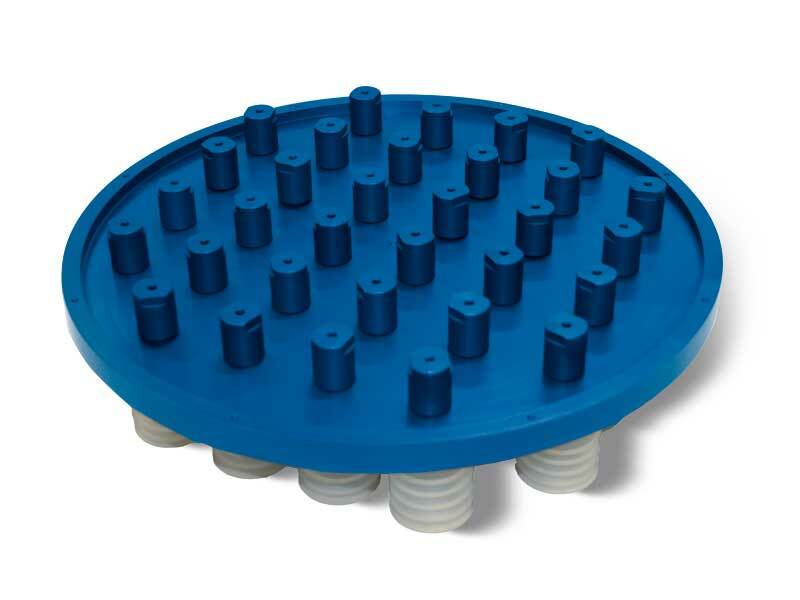 These suction plates have been designed to allow gripping paper or plastic bags containing powders, granulated products, bulk products or liquids. These suction plates are associated with OCTOPUS systems that fully exploit their performance. 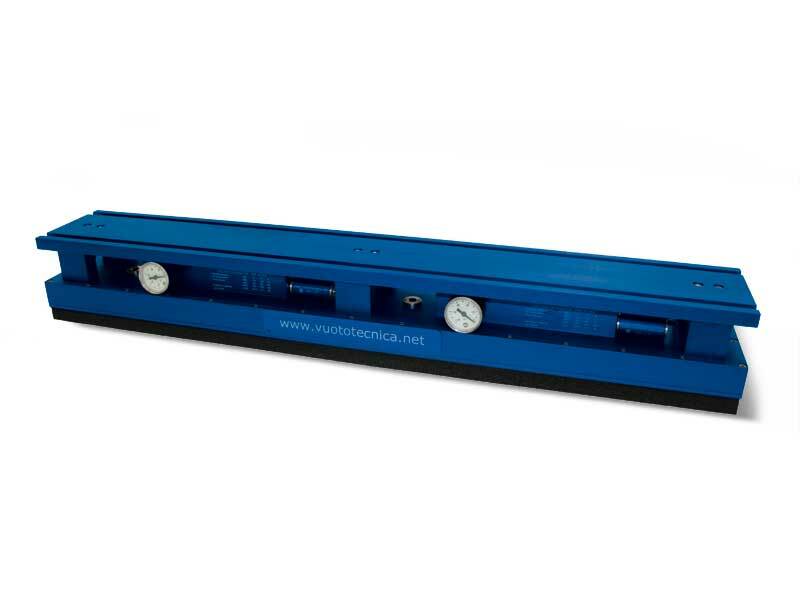 They are made with anodised aluminium and are provided with a special foam rubber seal. They are perfectly interchangeable with the OCTOPUS system standard suction plates. The shapes of the seal and the face allow reducing bag deformation in the Gripping phase, reducing vacuum loss to the minimum and guaranteeing the largest gripping surface possible. 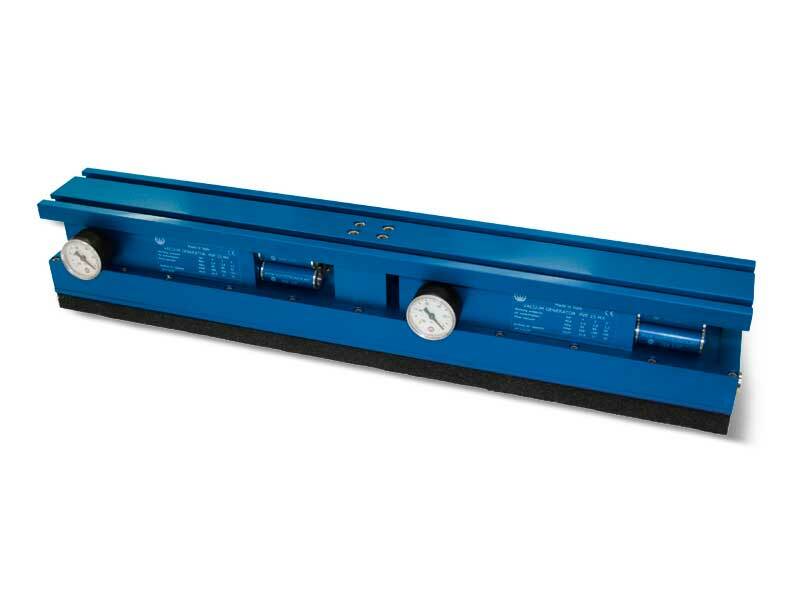 Their lifting force has been calculated considering a minimum vacuum level of -75 Kpa, the overall gripping surface enclosed in the seal and a safety factor 3. 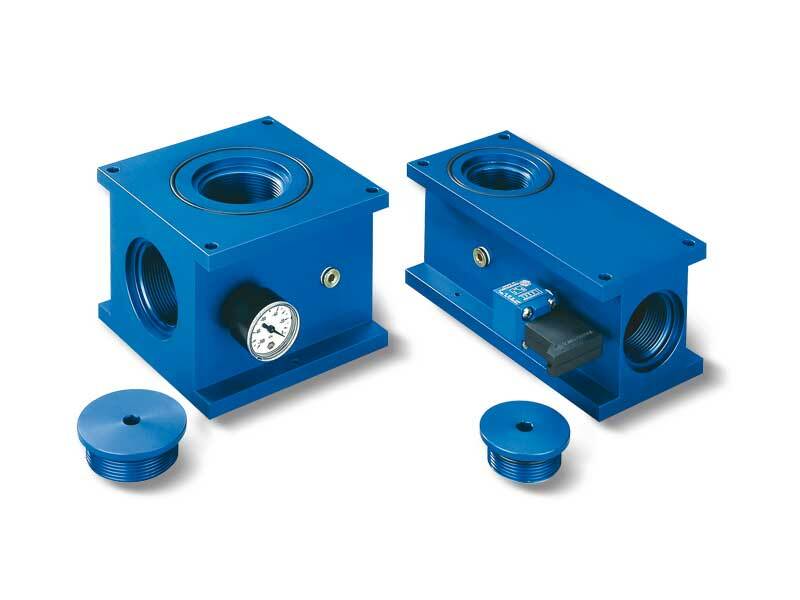 The fixing supports described in this page have been designed to connect an OCTOPUS system to a remotely installed vacuum generator or to an alternative vacuum source. 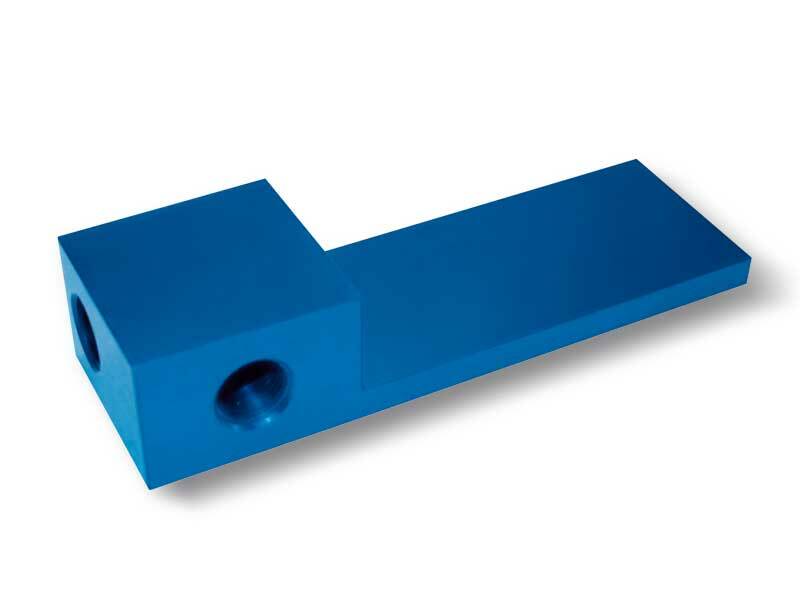 The anodised aluminium supports are provided with two flanges: one to fix the OCTOPUS system instead of the vacuum generator and the other to connect it to the machine. 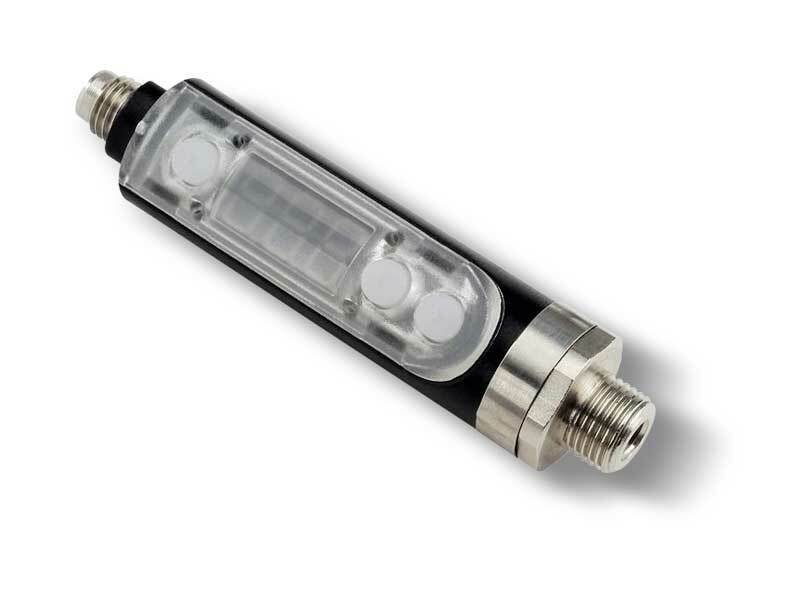 They are also equipped with connectors for direct connection to the OCTOPUS system, to the generator or to the alternative vacuum source, as well as to the vacuum level reading and control devices. The unused connections may be closed with special metal caps which they are equipped with. Note: The vacuum gauges and switches in the picture are not integral part of the supports. - A box made with light alloy, sealed by a suction plate coated with special perforated foam rubber. The suction plate perfectly adapts itself to any surface, either smooth, rough or uneven. These bars allow gripping objects of any shape and feature, provided that they do not have an excessive transpiration, without having to change or place vacuum cups and even when their surface does not occupy the entire suction plate. The maximum weight of the load to be lifted will obviously be proportional with the gripping surface. The connections provided for are four: one provided with quick coupler, for supplying compressed air to the vacuum generator; one for the possible installation of a vacuum switch, and two, closed by a threaded cap, for the air inlet inside the OCTOPUS bar in the discharge phase, for a prompt restoration of the atmospheric pressure. The suction plates PX described in this page are installed, as a standard, on all OCTOPUS gripping bars and, therefore, they can be supplied as a spare part. They are made with anodised aluminium and coated with special perforated foam rubber, with two types of thickness: 20 mm with suction plates of the PX range, 30 mm for special suction plates of the P2X range. 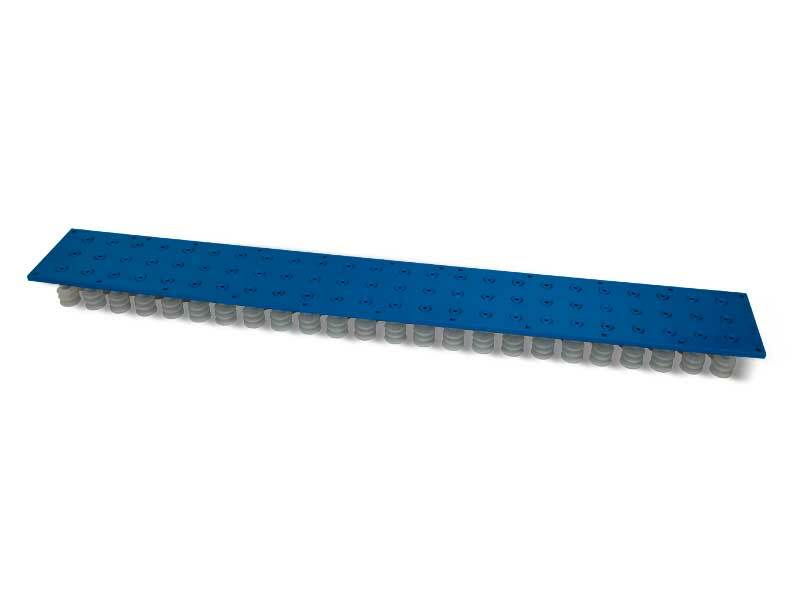 Their lifting force has been calculated considering a minimum vacuum level of -75 Kpa, the overall perforated surface on the foam rubber and a safety factor 3. These suction plates provided with vacuum cups have been designed to ensure a better grip on uneven and very flexible surfaces (pasta or candy bags, blister or skin-film packs, thin cardboard boxes, etc. 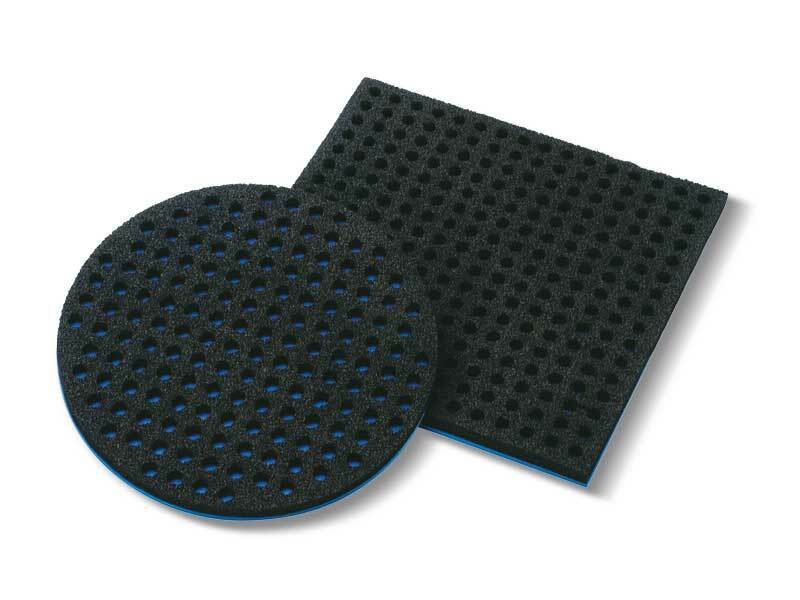 ), which are difficult to grip with suction plates coated with foam rubber. We recommend using bellow cups. 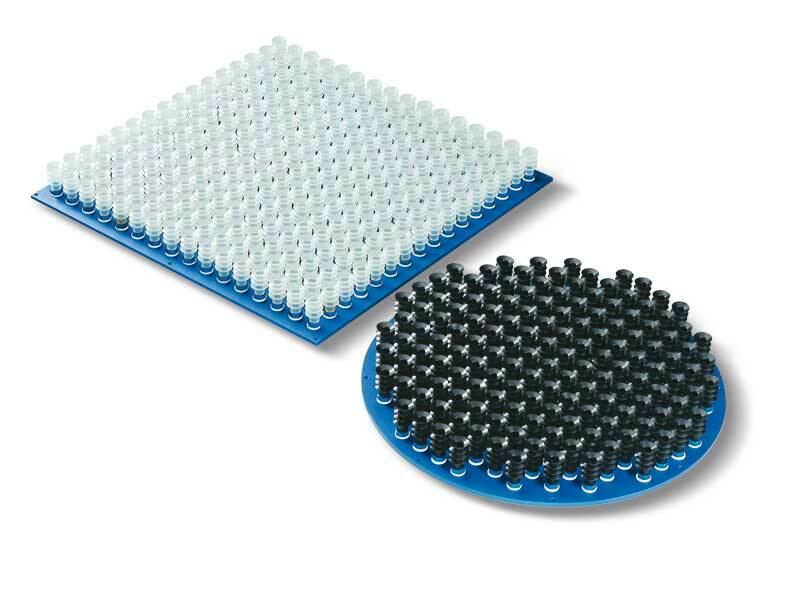 Thanks to their great flexibility, they adapt themselves to any gripping surface, following its profiles and movements during the lifting phase, guaranteeing a firm and safe grip. They are made with anodised aluminium, as are the 1/8” vacuum cup supports screwed onto them. 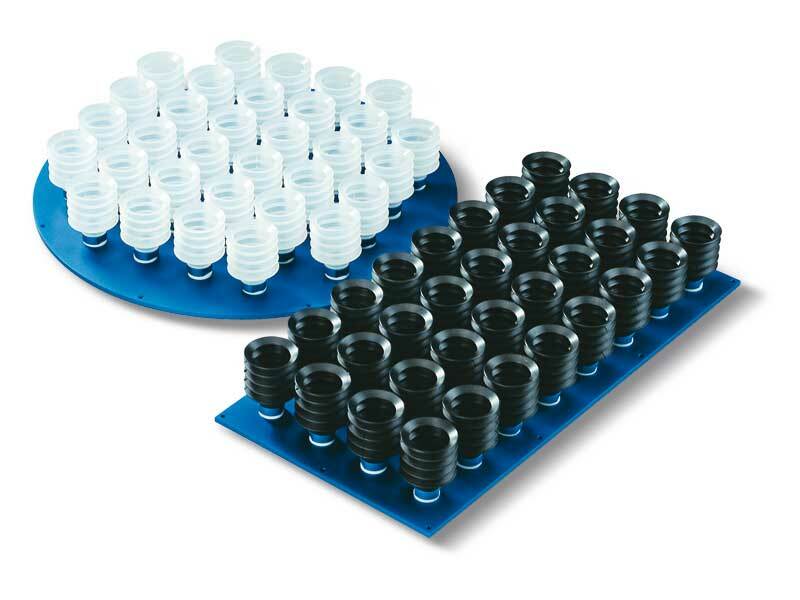 The cups are cold assembled onto the supports with no adhesives and can be provided in other compounds. Also these suction plates are perfectly interchangeable with the standard ones. Their lifting force has been calculated considering a minimum vacuum level of -75 Kpa, the overall vacuum cup surface and a safety factor 3. Upon request, they can be provided with different cups, as long as the diameter does not exceed 22 mm. The suction plates described in this page are the same as the previously described ones. Their distinctive features are the shut-off valves inserted in each cup support connection. In absence of an object to grip or in case of a defective grip of the foam rubber, the shut-off valves automatically close the suction inlet, thus preventing the vacuum level from decreasing on the other gripping holes. This feature allows reducing the vacuum generator capacity compared to the OCTOPUS systems without valves, to the benefit of energy saving.